Whether you choose to use this as another act in Dave Arch's One Man Circus Sideshow or as a stand-alone twenty-minute act or merely take some of its effects and insert them into a show you currently do; you'll be using a routined collection of flea circus acts with complete scripts refined over ten years of performance. No mechanical contrivances to go wrong. Minimalistic in props and yet believable in the effects it produces - causing an audience to enter that world of fun where reality blurs with fantasy. Comes complete with its own specially-commissioned poster for advertising your next appearance. Well worth the admission price!! 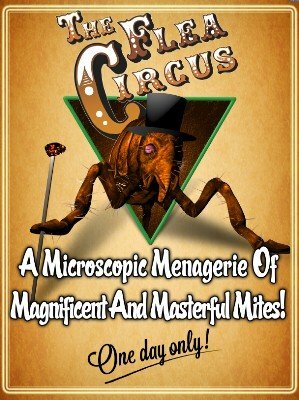 Some useful ideas for the aspiring Flea Circus entrepreneur.